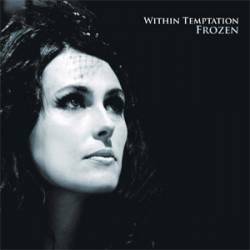 "Frozen" is the third single from the Within Temptation album The Heart of Everything (2007). The single was released in Europe on June 11, 2007. The song and the video both deal with the issue of domestic abuse. On their Web site, the band explained they wanted to raise awareness about "a subject that we feel is not discussed in public enough." The band will donate the income they receive from Sony/BMG for the “Frozen” single to Child Helpline International. In the UK, the song "The Howling" was chosen for the second single, available as a digital download only. The Frozen single contains single versions of both these songs. The music video's plot supports the claim that the track is about childhood abuse and domestic violence. It portrays an alcoholic who beats and presumably rapes his wife and daughter, and at the close of the video is killed by a poison slipped into his drink by his wife. The wife, as a result, is put in jail and possibly sentenced to death, leaving the child an orphan. At the beginning and in the final moments of the video, she is shown writing a letter to her daughter. The video also features the band playing the song.